Fall is my favorite time of year, even though part of me dreads its arrival. Not only does the end of another year make me a little melancholy, but also these shorter days are followed, inevitably, by longer nights. So much darkness. Thank heavens I don’t live near the Arctic Circle. After a suffocating Texas summer, lying in bed with the windows open to a cool October night is a treat that seemed far out of reach in July. Tasks that were burdensome on hot days—walking for exercise, firing up the oven—are doable again, even enjoyable. Best of all, fall is a migratory season, and spending the early evening hours outdoors with Glen, the binoculars, a camera and a cocktail becomes the much-anticipated end to every day. 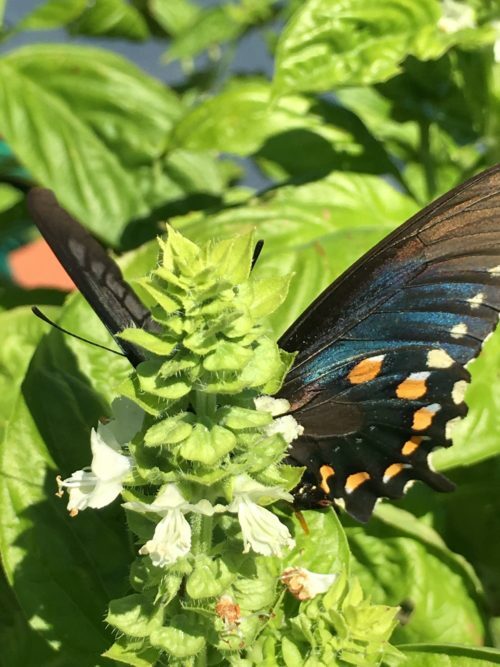 There are so many butterflies to see now that I’ve resisted cutting the blooms off the basil just for them. Whether they stop for refreshment or not, almost every one we see comes in from the north and flies away south. Many of the birds we see now are traveling the same direction. We’ll have our annual warbler and vireo visitors, as well as more of the usual inland migrants, but the variety doesn’t stop there. The countryside in this part of Texas has more water than where we used to live. Most properties have stock tanks, and some (including ours) have small soil conservation lakes. That makes the area very attractive to waterfowl and other types of water birds. We’ve seen a few ducks already this fall, but the ones that winter over will be along a bit later in the year. Water birds that winter further south, however, began streaming overhead weeks ago. A partial list of what we’ve seen includes Roseate Spoonbills, Sandhill Cranes, a single Whooping Crane in a flock of Sandhills, American White Pelicans, Wood Storks (which may or may not have a small population living year-round nearby) and either Glossy or White-Faced Ibises (they wouldn’t hold still long enough for me to be sure). As I write this, an American White Pelican floats on the soil conservation lake behind our farmhouse. It’s been resting there for a couple of days. The area is peaceful, and the lake’s got good fishing. Some birds we never see. They pass through at night, and only their calls alert us to their presence. The other night I heard a bird I’ve never heard before, and hope never to hear again. Its call was so loud, so eerie and disturbing, that the cattle grew restless, and a few of them began to bellow. I first heard the bird in the distance, from a pasture hundreds of yards to the north of our land. As I listened, it continued to cry out every minute or so, moving closer each time, until it was almost at our window. 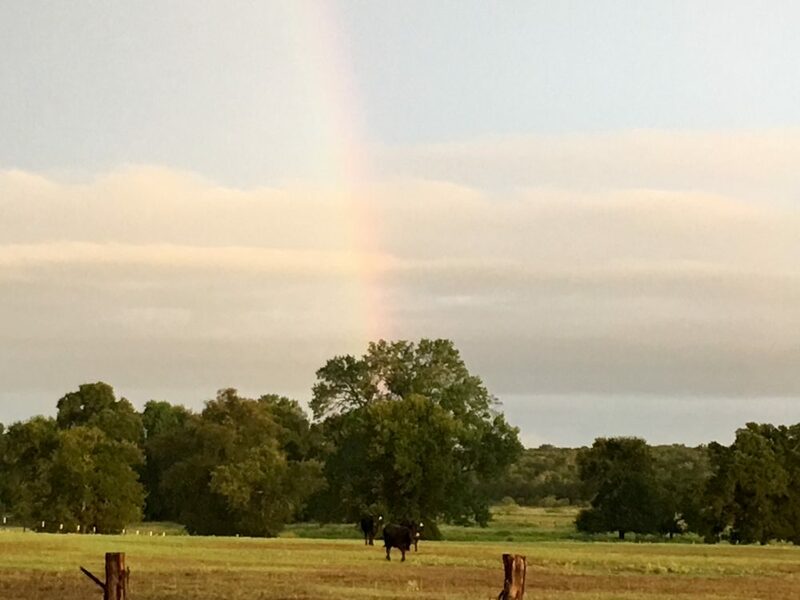 The last call came from our southernmost pasture, and then it disappeared into the black silence, the north wind carrying its piercing voice before it, to chill other people lying awake in their beds. When I was a child in San Antonio, I once saw a butterfly tree. We’d just learned in school about the migration of Monarch butterflies, that a swarm will roost in a tree for a few hours of rest before resuming their journey. They’ll cover the tree so thickly that it’s shingled in butterflies. A few days later, on a cool, damp evening in the fall, I went out to play in the front yard, and there they were, on a small tree not much taller than I was. It pulsed with orange-and-black wings. 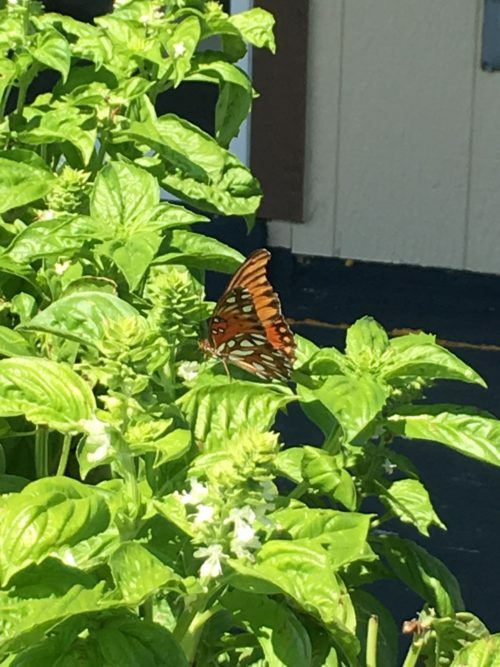 Many years on, Glen and I have lived directly underneath a Monarch fall migration route, and we watched them for hours as they fluttered south to Mexico not far over our heads. But I’ve never had the luck to see another butterfly tree. In our younger days, Glen and I viewed our lives as a kind of migratory journey. We’d both traveled when young, and lived as emigrants overseas. As married adults, we moved in tighter circles, not so far afield anymore, but even so, for the first half of our marriage we were never in one place for long. Every so often, we sought different scenery and new experiences. For the 16 years before moving to the country, though, we had been more settled. Now, in the ultimate conclusion of that transformation, we’re building the place we intend to live in for as long as we’re able (see August 18th, “The Forever Home“). I used to believe that to be rooted was to slowly die. That staying mobile was the key to staying youthful and engaged. Now that I’m of a more permanent inclination, I’ve come to hope that being firmly grounded is the way I’m meant to grow old. With my husband beside me, we will put down roots and rise up tall and strong and wise together. No more migrating. Not for us. But in our arms we will provide rest for the wings of those who do. this a beautiful dscription of the season and yours and Glens future together in the wide open spaces. Loved it! Beautiful writing, Susan. It flows like a river! Pulls me in and along on migrations in nature and in your lives. What joy, peace, perfection. Thanks for all you share. It’s my pleasure, Claire, and it makes me so happy that you enjoyed reading it! Thank you for your lovely description! 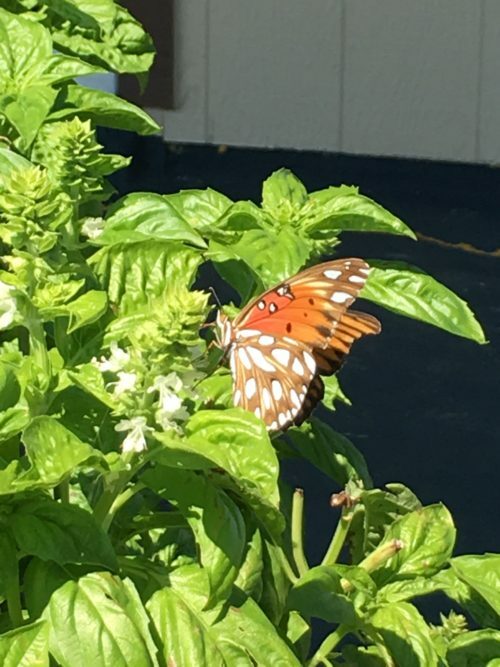 Beautiful–I love the magic of your butterfly tree and your hospitality to your many winged guests! And your basil is so lush! Enjoyed the post! Dear Susan, I have read and liked your article. There is truth and sincerity in your statement. You and Glen have chosen a path together and are strength to each other to walk together. You enjoy every byproduct of nature around you that inspires you to write your innermost thoughts. And poetic verses. You are unique with your imagination. Please keep writing for us to peep into your life you have chosen to enjoy and relax. I my deep blessings are with both of you. I appreciate that very much, Shubh! I am always amazed by your ability to allow me to actually see your words. Love the last part.